Apple’s announcement this week at the end of the Worldwide Developer Conference is some of the biggest podcasting news to happen in years. That’s why I’ve decided to dedicate an entire episode to it. Microsoft’s new “streamlined” operating system, Windows 10 S, is being touted as the company’s attempt to compete more directly with Google’s Chromebook and Apple’s MacBook computers. Windows 10 S is aimed at the education market, and to a lesser extent, large businesses who are looking to minimize some of the headaches that can occur when users are allowed access to a full-featured operating system like the standard version of Windows 10. The one thing that really makes Windows 10 S stand out from its predecessors is that the operating system will only allow applications to be installed from within the Windows Store. Taking a cue from other OS developers, Microsoft will fully vet all applications that are aded to the Windows Store, in the hopes that this will minimize operational problems like viruses and malware. Having this level of control will make it easier for hardware suppliers to sell and deploy computers at an institutional level. And while the vetting process that comes with the Windows Store is likely to be a welcome change for system administrators, it may leave some individual users in the cold. Especially those who’ve been relying on the Windows version of Apple’s iTunes to consume media like music and podcasts. Fortunately, it was recently announced that Apple is working with Microsoft to bring iTunes to the Windows Store. That means iTunes podcasts should be available on all modern versions of Windows for some time to come. Now that this has been taken care of, can Apple get to work on porting its Podcasts app to Android? It’s seriously overdue. Ever since Apple launched the iOS Podcasts app, effectively giving podcasts a dedicated location on Apple mobile devices, speculation has occurred that one day, Apple will break podcasts free from the desktop iTunes application in a similar manner. While that hasn’t happened yet, having a dedicated desktop podcast-consumption app made by Apple may be getting closer. In February, Eddy Cue teased that the company is working on new features for podcasts at the Code Media conference. Combined with this rebranding, it is possible that Apple is readying a big announcement for later this year, potentially at WWDC. Renaming the iTunes podcast directory to Apple Podcasts falls in line with other Apple branding efforts, such as Apple Music and Apple TV. It’s possible that the Cupertino-based tech giant is finding the “i” designation that rose to fame with products like the iMac, iPod, and iTunes is in need of a refresh. Regardless, it’s good to see some real attention being paid to Apple’s podcast directory. Along with this new name, Apple also released new guidelines for publishers who’d like to link to their listings on the Apple Podcasts directory. These guidelines include a new set of badges that make use of the Apple Podcasts name in place of iTunes (see image above). February is Black History Month. This year, iTunes chose to put together a list of podcast, books, TV, and more to “shine a light on current and historical leaders”. The selection is called The Black Experience. The list is a good place to find a podcast to listen to that is new to you. Intersection is hosted by New Republic editor Jamil Smith. In his podcast, he explores how race, gender, and all the ways we identify ourselves and one another intersect. Errthang Show! is hosted by Al Letson In his latest project, he takes all the things that are floating in his head and turns it into a mixtape of delight for you. Another Round is from BuzzFeed. Hosts Heben Nigato and Tracy Clayton cover everything from race, gender and pop culture to squirrels, mangos, and bad jokes, all in one boozy show. The Read is hosted by Kid Fury and Crissle, who share their weekly “read” of hip-hop and pop culture’s most trying stars. The Friend Zone is hosted by Dustin Ross, HeyFranHey, and Assante. They explore mental hygiene. 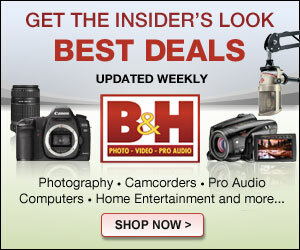 You can send questions and inquiries to their show. Our National Conversation About Race is from Panoply. Co-hosts Anna Holmes, Baratunde Thurston, Raquel Cepeda, and Tanner Colby host a lively multiracial conversation about the ways we can’t talk, don’t talk, would rather not talk, but intermittently, fitfully, embarrassingly do talk about culture, identity, politics, power, and privilege in our pre-post-yet-still-very-racial America. The Combat Jack is described as the undisputed #1 HipHop podcast. The show features interviews with HipHop icons and the most in-depth conversations about music, news, culture and Race. Race Wars is hosted by Kurt Metzger and Sherrod Small, who cut through all the layers of politically correct media spin to deliver hysterical and truthful opinions on social, racial and global topics. So Well Spoken is hosted by Angelus, Mike, and Morris. They have a round table format to discuss race relations, current events, entertainment, and pop culture. Apple unveiled its Best of 2016 list early in December. The list includes the best apps, music, movies, TV shows, books, and podcasts of 2016 across App Store, iTunes, Apple Music, and iBooks. Podcasts hit an impressive milestone in 2016: globally, Apple listeners consumed over 10 billion downloads and streams over the past 12 months via iPhone, iPad, Apple TV, and desktop. Fresh Air from NPR is the top downloaded podcast of the year. In addition, iTunes has put together a list of the Best Podcasts of 2016. This grouping of podcasts is described in iTunes as “favorites”. They are simply listed together in one group (and are not ranked against each other). Each is listed with a quote from iTunes explaining why it was selected. “We’ll crash this party anytime. Jessica, Phoebe, and their hilarious guests bring enough energy and fearlessness for 10 podcasts”. Every year, things slow down a bit at Apple during the holiday season. And 2016 is no different. Last week, Apple sent an e-mail to all registered iTunes Store content providers to let them know what Apple is planning for the rest of the year. 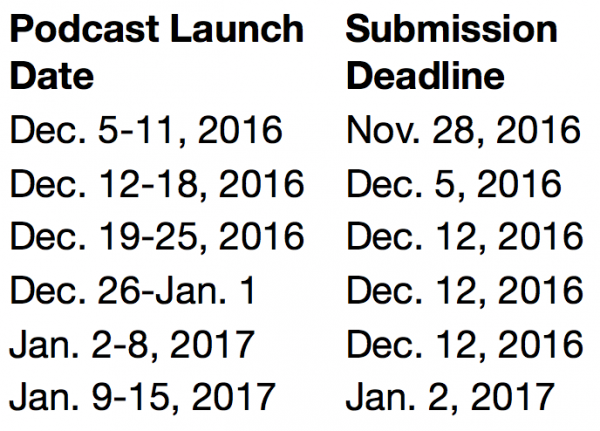 Make sure you keep these dates in mind if you’re planning on launching a new podcast before the end of the year or if you find you need help with an existing iTunes Store listing. About a year ago, I suggested that it was time for the iTunes team to create a dedicated user portal for podcasters. Perhaps someone over at Apple is listening. Last week, podcasters looking to add new shows to the iTunes Store noticed that the “Submit a Podcast” option that’s been available in the iTunes desktop application since Apple first added podcasts to the platform, was gone. A few days later, the option returned. 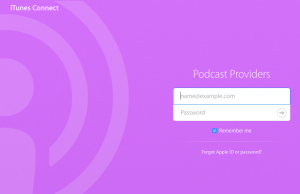 Instead of opening a submission form inside the iTunes application as it has always done, clicking the “Submit a Podcast” link now opens a web browser that directs to the new iTunes Connect page. Apple brought this new podcast dashboard online with little fanfare. It’s possible they’ve done this to cut down on some of the frequent support requests they receive (refreshing feeds, changing feed URL’s, etc.). This web-based system also makes it possible to submit podcasts using devices other than Mac or Windows computers. 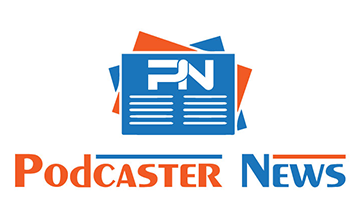 It’s the logical next step for what is still podcasting’s biggest directory to give a little more access and control to those of us who are providing its content. It’s a long overdue change. Back in 2005, we were thrilled to bring podcasts to iTunes – and a decade later, we’re as excited as ever. We’ve gone from 3,000 shows to hundreds of thousands, seen the medium explode internationally, and watched hits like Serial and WTF with Marc Maron capture audiences like never before. As the world of podcasts has changed, podcasts have changed the world. Celebrate their success with our favorite shows over the past decade, spanning everything from longtime classics to emerging superstars. It’s worth noting that this list isn’t celebrating shows that have been around for ten years. Rather, it’s a collection of shows from the last ten years that are still ongoing and (more importantly) liked by the iTunes Podcasts team. Congratulations to iTunes on its tenth year in podcasting! Now, how soon ’til we get that user portal?